Magazine holder close-ups, a photo by floating ink on Flickr. Within an hour or so I had three neatly covered boxes, the ones you see at the top of this post. I’m pretty chuffed about them. 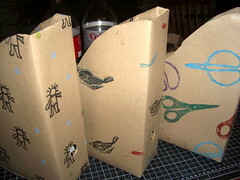 I’m especially pleased with the scissors stamps, which I made by photocopying my two favorite pairs of scissors, cutting out their paper images, then tracing them onto kids’ craft Foamies (is that what those sheets are called? 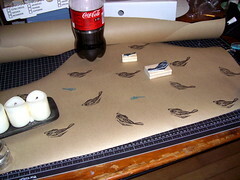 ), cutting them out (with their original real-life counterparts), then using a dead ball point pen to make impressions of their details before stamping with them. Anyway, I think they look great in the new shelves. If only they didn’t show up the way-overdue-for-fresh-paint walls behind them! *Thanks to a generous donation from a friend, I may soon have a much classier way to store and transport the stamps–stay tuned. I made a present for someone with a birthday this week (who doesn’t, fortunately, read this blog). Someone who likes blue. My Better Half came home from an estate sale a few weeks ago saying, “there was a lot of cool stuff there–you should make me a list of things you want me to look for at tag sales and auctions, in case you aren’t with me.” Art supplies and old kimono fabric, said I. He looked crestfallen. He had seen both within the previous two days. It was too late for the kimono fabrics, which apparently went for a song at an auction, but I did get to go back with him to the estate sale selling art supplies, and picked up some wonderful big brushes, some old books that can ethically be cannibalized for projects, and a whole heap of canvases–the whole lot for $5.00. Sometimes these sales make me sad, but at this one the grown son of the artist (his mom) was genuinely happy to have her art supplies being carried off by people who appreciated and were going to use them that I didn’t feel so badly. But the kimono scraps stuck in my head, so I started surfing for them online, and . . . voila: I bought the first of what I hope will be many. This one started life as a sleeve, probably in the mid-20th century, and over the last day or so I transformed it into what I think is a quite elegant scarf. 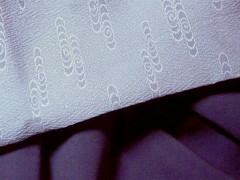 The fabric is silk crepe de chine with a pattern of what might be highly stylized clouds, but might also be ripples in a pond. 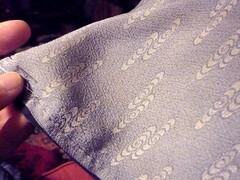 Either way, they’re lovely, the fabric is in great shape, and I was able to find a nice silky crepe in a contrasting color (a sort of storm-cloud blue-gray) that works either way to use as a backing for it. I took the top picture yesterday when I was starting the (hand) sewing, and the bottom one this morning after I finished it. I took them in different rooms and in different weather, but the top picture gives a better sense of the actual color, which is slightly grayish. Looking at both pictures, though, shows the slight difference in the pattern–one side is sort of a negative of the other. I debated long and hard about which side to have show, and involved everyone in the family in making the choice. In the end, Second Child pointed out that it was a win-win, as the two sides are equally pretty. And, honey, you picked exactly the right thread color when you went to the fabric store with me, but I still don’t get that you don’t get that a scarf doesn’t have to be wooly and warm to be desirable. As I said before, my first foray into woodcutting was great fun. A real challenge. Cool. And dangerous. I forgot to show you my new favorite woodcarving supplies. And the reason for them. I left out the Connecticut Chain Saw Massacre pictures. Suffice it to say it wasn’t as bad as it would have looked in those pictures but that fingers (and fingernails) are a lot easier to carve through than wood. Inspired by this post at Katherine Marie Photography (via Whipup), I’ve been musing about what’s on my own top-ten list. My watercolors. I’ve got several kinds, in both cake and tube form, in large and small sets, but the one I keep turning back to is my ancient set, the one pictured (at least until I change it on June 1) in my blog header above. Staedtler Mastercarve art carving blocks. LOTS of Staedtler Mastercarve art carving blocks. I use other things for carving stamps and illustrations, too, but this is my favorite material so far. I wish it were easier to find in my area, but there’s always the internet. 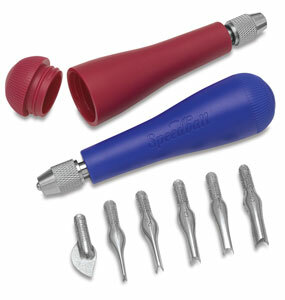 Speeball carving tools. I have other sets, but I reach for my basic set–2 handleswith interchangeable blades–more than any of the other. My self-healing cutting board and my cork-backed steel ruler–these count as one to me, since I’m always using them together. My Japanese screw punch, a gift from the Better Half. This one is so useful and so amazing that it should probably be higher on the list. Every time I use it, I find myself exclaiming out loud about how brilliant it is. 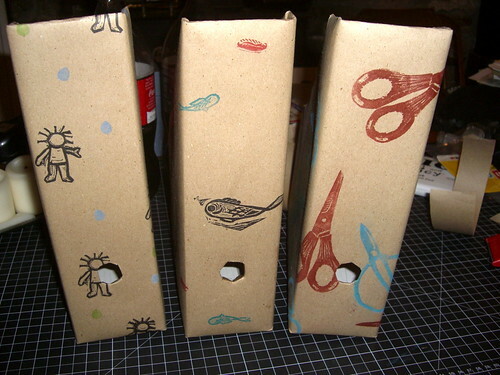 Makes perfect holes of just the right size; essential for book-binding projects and all kinds of other useful tasks. An assortment of wonderful papers. Sorry, this counts as one thing, too. My jar of colored pencils. And just because Katherine Marie gave us two lists of 10, here are 10 little doodads that I suppose I could live without, but working with art materials wouldn’t be nearly as easy without them. My pinkie-sized spray water bottle for keeping the watercolors wet. Also works on my wrists and the back of my neck during hot flashes. Single-edge razor blades. I buy them in boxes of 100 at Lee Valley. My tiny little spring shears, again from Lee Valley, who will sell you a dozen pairs for only $4.95, which gives you enough that you can share with a few friends and still not melt down in tears when the TSA confiscates the pair you accidentally leave in your knitting bag in your carry-on luggage. Yeah. Cat whiskers, which Nemo kindly provides for me on a regular basis. Nice for manipulating the pattern of the ink when you’re doing suminagashi. My little froggie incense bowl (which doesn’t actually have any incense in it in the photo below) and a steady supply of Viva pine/sandalwood incense sticks. I like to start each art session with a short dedication and this frog bowl pleases me very much. 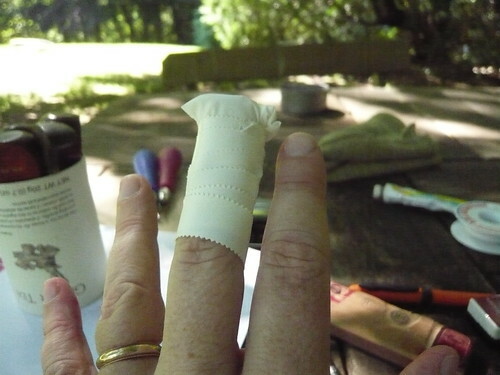 A little hand fan–good for moving inks on water (and again for the hot flashes). 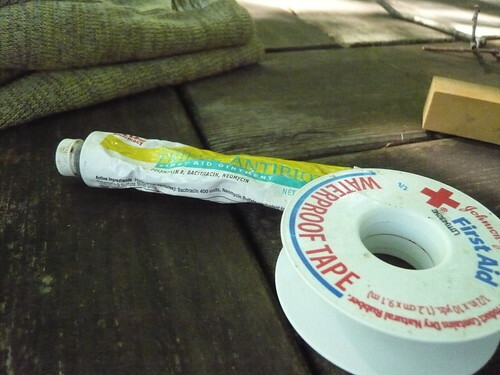 Can also be used carefully to hasten the drying of an over-wet watercolor mark. Knox unflavored gelatin for gelatin monoprinting. 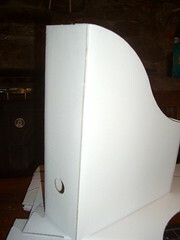 Sheets of baking parchment to put under the area where I’m working with paints, glues, and inks. 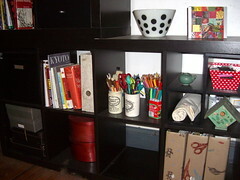 My studio is my kitchen table, and this makes clean-up easier. I keep several sheets just for this purpose and use them over and over again. A family who (mostly) doesn’t mind when dinner is late (or sandwiches) again because I just want to pull one more print or because the table is covered with little crumbs of Mastercarve and half-finished stamps. Actually, that last one should probably be way at the very top of this post. I Excuse me while I go now and make supper.